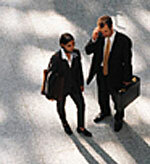 Our track record in conducting searches for corporations throughout the country is impeccable. Clients request our representation on searches for general counsels, associate general counsels and junior lawyers. Our clients range from publicly traded companies to small privately held corporations in a wide range of industries.